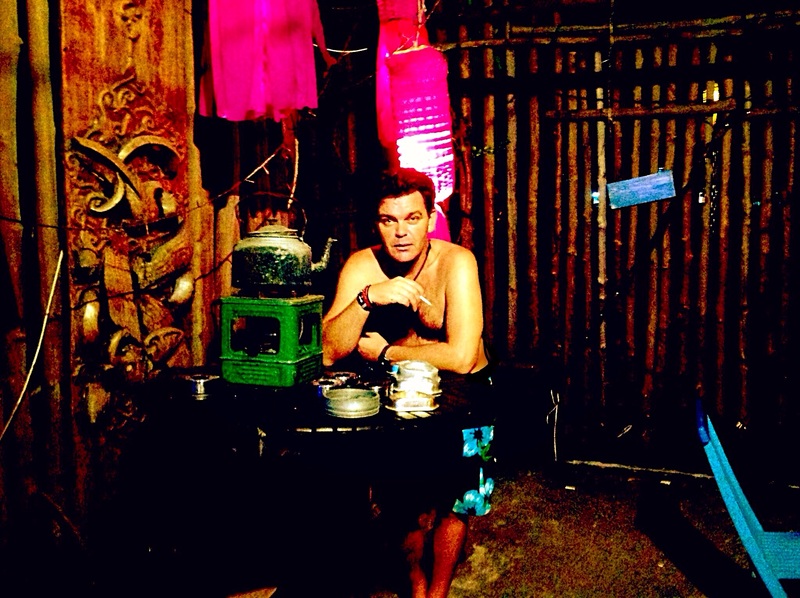 The Not So Secret Sanctuary – In Borneo….. | The Lola Boys Do The East ! 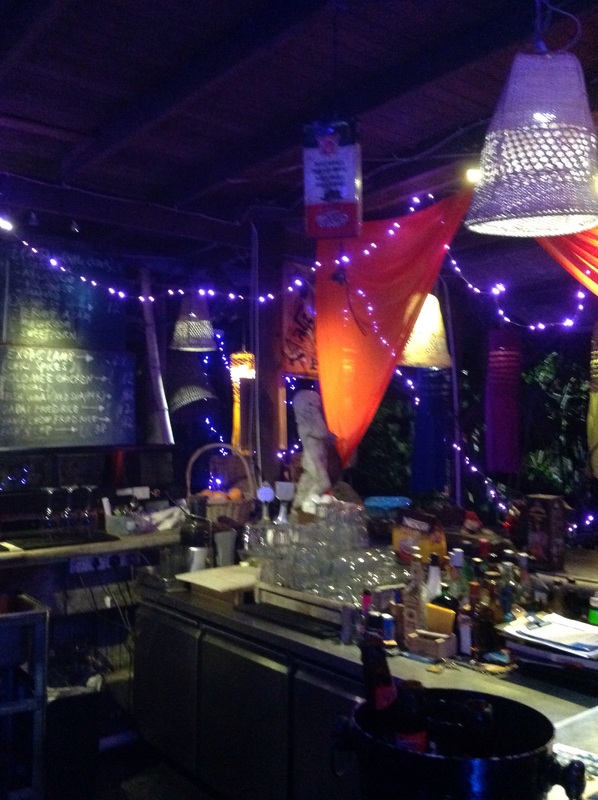 The Not So Secret Sanctuary – In Borneo….. I, inadvertently, made a reservation for two nights at a nudist guest house called ‘The Secret Sanctuary – perhaps that was the secret! After a well needed sleep and a morning tour around the grounds, we found ourselves enchanted and have decided to throw our caution and attire to the wind and extend here …..
By that, I mean our stay! Cyril, the creator of this fascinating abode, takes great pride in ensuring each of his guests is treated like a friend. That is, if one is allowed through the wonderfully waterfalled entrance gate in the first place! If Cyril decides he doesn’t like the cut of your backpack – he turns on the tap and the wet stuff gushes,Niagara-like, both surprising and soaking any unwanted patron. If, however, he’s not keen on you leaving – the floodgates are opened once again to make sure that any getaway is sodden. We love it here – so we’re hoping for a very damp exit! The sheer style and and genuine Bohemian beauty of this lucky find belie the fact that the lodging is situated adjacent to a very busy dual carraigeway. This small irritation does nothing but remind its’ clientele of the absolute haven Cyril has created in one of the once, less salubrious suburbs of Kuching. 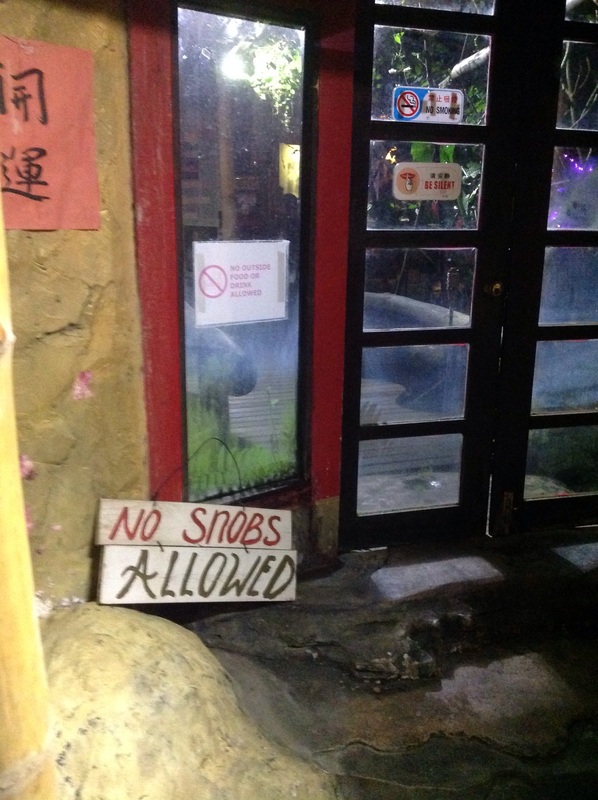 ‘No Snobs Allowed’ reads the sign at the front door. I’m surprised he let me in! But very glad he has. The staff, the easy ambience, even the other guests, (including the ubiquitous loud, bloody annoying, European family! 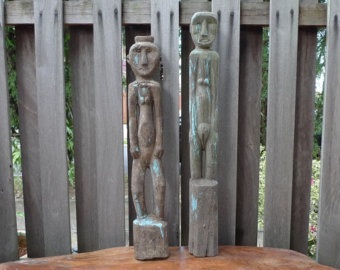 ), are marvellously eccentric and seem most at home here. As I hear the song ‘It’s All Too Beautiful’ playing via Cyrils’s perfectly orchestrated soundtrack, I remember a distant English teacher, Mrs Carter, reminding me not to use too many cliches when writing. So I will only put on record – it’s almost too beautiful. Andrew and I have nicknamed Borneo – ‘Horneo’! For reasons I had better not go into whilst blogging. I would not want any reader to be put off their first meal of the day. Suffice to say there’s a very energetic vibe here – which is probably why we look so knackered in most of the photos! Maybe there is something in the water – other than the colourful fish in the foot spa! We have both dipped our toes into this slightly unnerving pool more than once. The fish, unfortunately, do not seem to have a taste for me. Andrew, on the other foot, appears to be a veritable fishfood smorgasbord ! Breakfast, lunch and dinner! All at one swimming! I’ve been lucky if the fussy little tiddlers have bothered to fin their way over to my ‘plates of meat’ for just a little ‘cheese and biscuits’, after they’ve feasted, so heartily, on my partner in brine! I’m taking this as a compliment. After all, as long as I get nibbled on by something now and then, I’m not bothered about having my own miniature marine harem. Andrew obviously needs the attention. Great!! You know how to enjoy life!